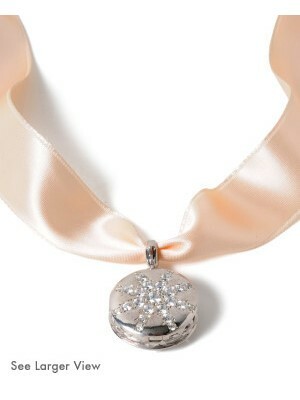 Aglow with 25 handset stones in a starburst pattern, this special locket comes on a double-faced extra long tie ribbon in a flattering blush color. Choice of Rhodium or 18 K gold tarnish- proof plating. Clip bale for easy attachment to chains. NEW magnetic closure and custom wicks. Aromatic vapors gently diffuse though the fine wreath of leaves on the sides of this locket. Just place a fresh wick inside, add a few drops of your chosen essential oil or fragrance and breathe. Measures 1” X 3/8”. Includes five 100% wool fiber wicks; embroidered pouch and gift box.